For the past few years, I’ve leveraged a powerful third-party disk partition manager called EaseUS Partition Manager. Let’s dig into the tool and review why I’ve come to depend on it so heavily over the years. The partitioning tools built into Windows has evolved slowly over the past 25 years. Windows Vista added a graphical interface for creating and deleting partitions during setup. Since then, this important part of Windows utilities has pretty much stood still since then. The Disk Management Tools available from the desktop within the Microsoft Management Console are just as limited. More powerful options are available from the command line; this is 2016 though, and not everyone feels like playing with cryptic lingo to customize things to their liking. Editors Note: For a limited time, get a free copy Partition Master Pro. in our Free Giveaway. Offer ends Friday 8/5 @ 12pm Pacific. For the past few years, I’ve depended on a robust third-party solution called EaseUS Partition Manager. The free Home edition has been so impressive with its ease of use and welcoming graphical user interface; it’s one of the top utilities I add to my arsenal of apps, every time I install Windows. If you need more beyond the fundamentals, EaseUS offers a Professional Edition, which includes all the standard features available in the free home edition such as the ability to resize, delete, merge partitions, and convert partition formats. 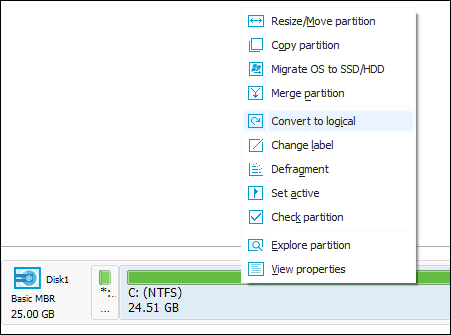 What’s New in EaseUS Partition Manager 11? Version 11, used for this review improves upon its WinPE creation, performance optimization, easier cloning and migration tools. The latest version includes support for Windows 10, but also works on older versions such as Windows 7 and even Windows XP. The system requirements are minimal; Partition Manager Professional can run on an old 500 MHz processor with as low as 512 MBs of RAM. 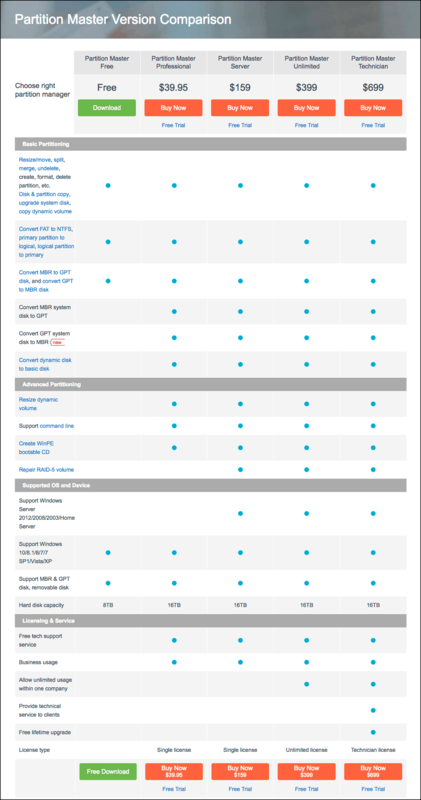 For a comparison of all the features available in each edition of EaseUS Partition Manager, click on following chart for details. The EaseUS Partition Manager interface is bursting with features. Users need not worry, tools and functions are logically arranged. The main interface displays all available partitions in the system, while a task pane on the left, list quick access to common operations users can perform such as SSD and hard disk imaging, partition resizing and conversion. EaseUS Partition Manager also includes diagnostic tools such as defragger, disk analysis, and property viewer. If your computer has a complicated partition setup, EaseUS can help you manage it. One of the latest trends among OEM PC manufacturers is the alphabet soup of unnecessary factory partitions a system can include. Due to the partition layout configured, some of these partitions might prove difficult to remove; due to being configured as dynamic disks. 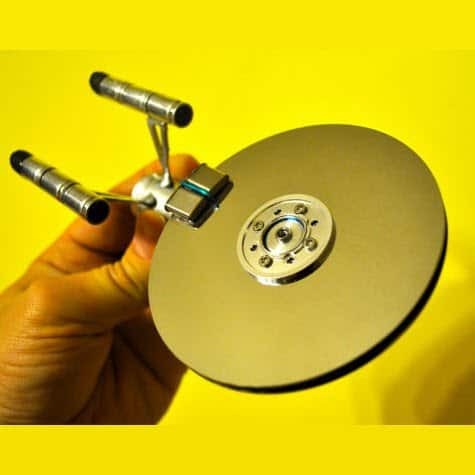 Unlike a Primary Volume, a Dynamic disk includes the ability to create multiple partitions. The problem is when you want to delete one or more disk partitions; either to merge with another partition or setup a dual boot configuration, this can affect the active primary boot partition. Converting to a basic disk can often result in making the system inoperable. EaseUS Partition Manager Professional takes the guess work out of such scenarios with a few easy clicks. Another head scratcher I often stumble across is resizing and shrinking partitions. Recently, I wanted to setup a partition on my Surface Pro 3, so I could try out the Windows 10 Anniversary Update. The problem was, I couldn’t shrink the SSD beyond 3 GBs. I tried all recommendations such as turning off hibernation and disk encryption, but none of that worked. I got fed up then gave EaseUS a try, and I was able to successfully create a 50 GB partition without complaint or error. Other scenarios where EaseUS can be used successfully, include, converting GPT (GUID Partition Table) disks to MBR; this is especially handy for systems that require using older 32-bit versions of Windows. Because MBR is limited to 4 logical partitions while GPT supports up 128 logical partitions, EaseUS can be used to convert larger disks if the need arises. I also found EaseUS handy for resizing system reserve partitions. Users attempting to upgrade to Windows 10 might hit this error. The error occurs during Windows setup because the recovery partition requires more than the limited 100 MB partition used by Windows 7 to store recovery files. I launched EaseUS, created a non-destructive partition to the left of the boot drive, with an additional 300 MBs, then extended the recovery partition to use the extra space. Windows 10 setup continued without a hitch. All of these functions can be performed in Windows from the command line; but if you are not a wizard at typing in command line operators and figuring out how diskpart works, you’re asking for trouble. The EaseUS user interface is friendly and logical; it works like how your mind thinks. Extending the recovery partition is an excellent example of this, I apparently wanted a partition in front of the system drive to allocate more space to the system reserve drive. If you want to take the guesswork and the risk out of managing your partitions; or avoid reading complex literature about how partitioning works, then Partition Manager Professional is the best disk utility to have. EaseUS Partition Manager Professional cost US $39. The entire application is a small 30 MB download; if you are interested, you can download a free trial and see for yourself. Installation was quick and easy, just double click the single setup file and after a few clicks installation is done. Cool! Thanks Andre. I got the free free key. Now I have to learn what all it does. That will take awhile! Easeus loads runs a service at startup, it’s using about 3% CPU for no good reason. Also, when I ordered the free I used a unique email address and now I get spam to it all the time so they seem to have sold my email address.